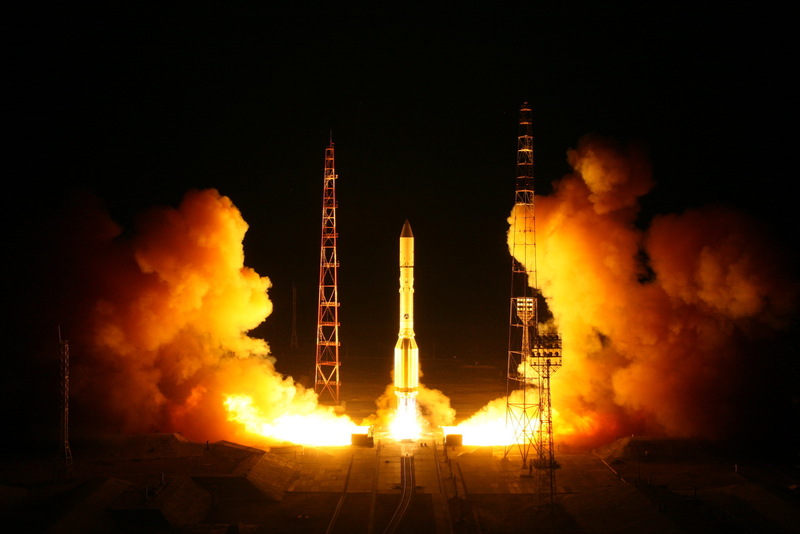 Destined to serve the Russian military and civilian customers, the first Blagovest communications satellite rode a Proton rocket into space at 2207 GMT (6:07 p.m. EDT) Wednesday, according to a statement released by ISS Reshetnev, the spacecraft’s manufacturer. Liftoff occurred at 4:07 a.m. local time Thursday at Baikonur, a sprawling spaceport leased by the Russian government from Kazakhstan. The three-stage Proton booster deployed a Breeze M upper stage shortly after liftoff to conduct multiple engine firings aimed at guiding the Blagovest No. 11L spacecraft into a high-altitude geostationary transfer orbit. The Russian space agency, Roscosmos, confirmed the Breeze M upper stage released the Blagovest satellite into an on-target orbit. After separation from the Breeze M stage several hours into the mission, the satellite’s own engine will circularize its orbit over the equator at an altitude of nearly 22,300 miles (35,800 kilometers). 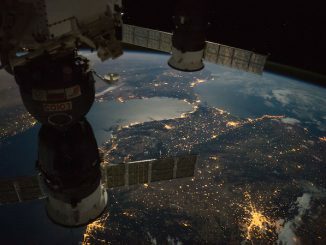 At that altitude, the Blagovest satellite will remain fixed over the equator at 45 degrees east longitude, staying in view of the same part of Earth and orbiting the planet at the same rate it rotates. Designed for a 15-year mission, the Blagovest No. 11L satellite was built for the Russian military by ISS Reshetnev, a Russian aerospace contractor based in Zheleznogorsk, Russia. It is based on ISS Reshetnev’s Express 2000 satellite bus. The relay spacecraft will serve Russian military and civilian users with a suite of C-band and Ka-band transponders. While ISS Reshetnev claimed the Blagovest communications payload was fully manufactured internally, information released by Thales Alenia Space indicates the French company supplied filters, power dividers and multiplexers for Blagovest’s telecom instrumentation. Three more Blagovest communications satellites are planned for launch in the next couple of years. Russia’s Proton rocket program, managed by the Russian company Khrunichev, has two more launches on the books next month. 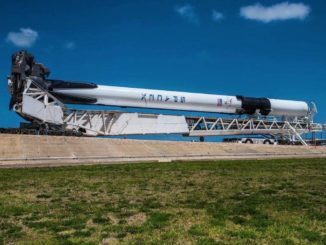 The quicker launch pace comes after a year-long standdown from June 2016 through June 2017 to resolve engine quality concerns. Wednesday’s launch was the 414th flight of a Russian Proton rocket since 1965, and the 100th launch of the Proton M configuration since 2001. While the mission with the Blagovest No. 11L satellite was part of Russia’s federal space program, the two Proton flights next month will be commercially managed by International Launch Services, a Virginia-based company responsible for selling Proton launches on the global market. 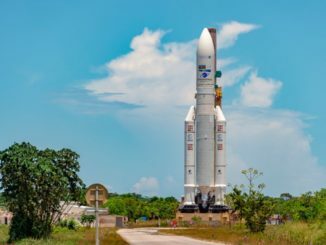 The Amazonas 5 communications satellite, owned by Madrid-based Hispasat, is already at the Baikonur Cosmodrome being readied for liftoff as soon as Sept. 9 on a Proton/Breeze M.
The AsiaSat 9 telecom craft is scheduled to blast Sept. 28 on a Proton/Breeze M.